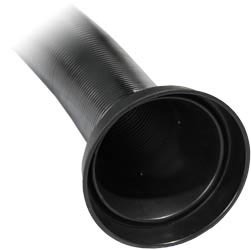 An exhaust hose is a secondary piece of equipment used to extract exhaust fumes and particulate, as an extension to a primary filtration system. 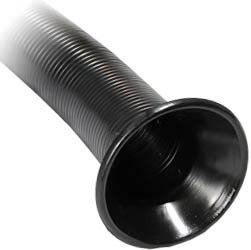 The initial purpose of an exhaust hose is to form a designated transportation method for redirecting fumes from the application to an air filtration system, or to another exterior location where the fumes can be vented off harmlessly. 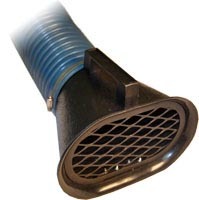 Flex Sentry™ exhaust hoses can be very useful fume extraction accessories in several capacities. 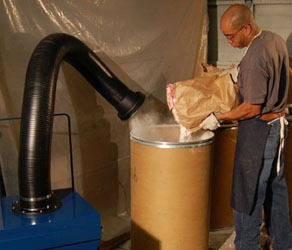 It can easily transform your existing fume extraction equipment into a source-capture configuration, serve as ducting between two objects, or function as a standalone exhaust hose. 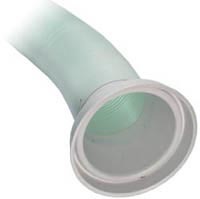 This semi self-supportive, flame-retardant* exhaust arm can be used with an optional round inlet hood for those seeking to extract fumes at the source of emission. 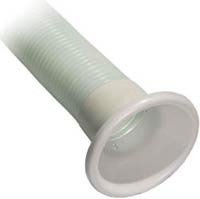 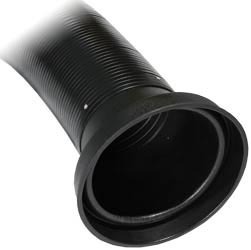 It can also be used as flexible ducting to connect existing machine ports to fume extractors or mist collectors during applications such as CNC machining and laser etching. 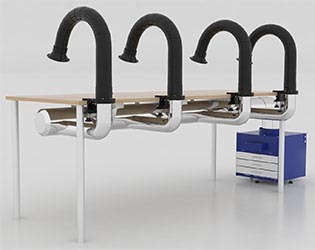 The mounted exhaust hose is an easily portable extraction arm that is lightweight and can quickly be adapted to a remote work area where a conventional fume extractor may not be practical. 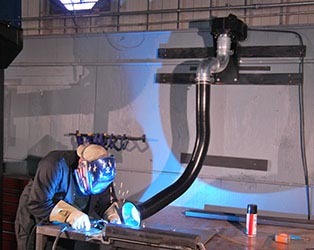 When connected to a Sentry Air Systems portable fan unit or shop exhaust, the mounted fume arm can be clamped to a table or used in other makeshift or temporary work areas. 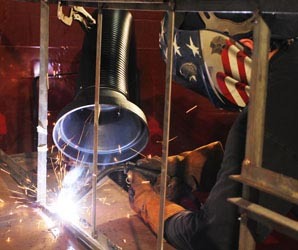 The mounted fume arm utilizes a fre retardant 4” diameter hose and is designed for soldering, brazing, TIG Welding or other light particulate/chemical fume removal. 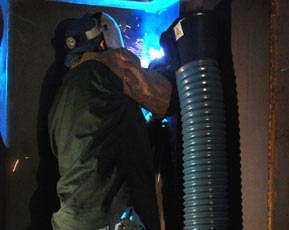 Connecting a multi-station 4” Mounted Fume Arm operation to a central exhaust or large fltration air handler is another excellent choice. 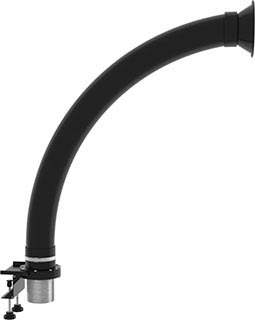 Sentry Air Systems’ Extractor Arm (without fan) is an optimal fume extraction accessory for applications that require exhaust without filtration. 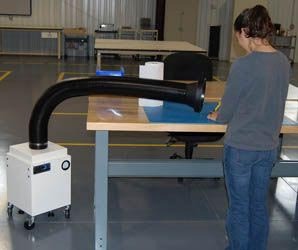 It can easily transform your existing fan and ductwork into a source-capture configuration for more efficient fume capture and control. 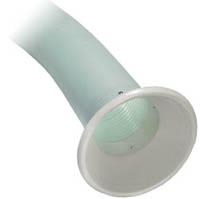 A wall-mounting bracket and 4” diameter exhaust collar are included for easy installation. 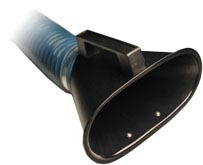 This flame-retardant, self-supportive flex arm is capable of 180° rotation and be can used in conjunction with a fan for a variety of applications including welding fume control, solder fume removal, chemical fume extraction, laboratory fume control, and a variety of fume and particulate-producing processes in manufacturing, medical, laboratory, and pharmaceutical settings. 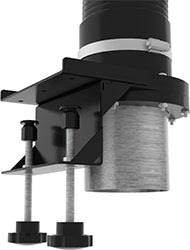 This unit is a standalone arm and does not include a fan.